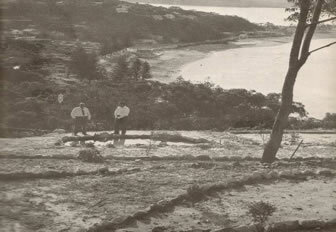 The Bible Garden was originally land belonging to the Garigal clan who frequented the area around Pittwater and West Head. They spoke a language known as Kuringgai (sometimes spelt Guringai), the same language spoken by Aboriginals from Broken Bay north to Brisbane Waters. It is from the Kuringgai name which Aboriginal people in south eastern Australia still use to describe themselves – kuri (koori). 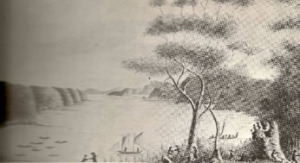 Captain James Cook recorded in his log passing Broken Bay in 1770. 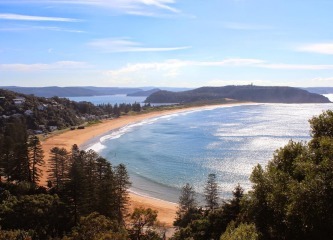 In May 1788 Governor Phillip sailed The Sirius, a member of the First Fleet, north along the coast from Port Jackson, past Palm Beach and into Broken Bay, seeking suitable land for cultivation to feed the one thousand souls who had travelled across the world with him in their tiny ships. 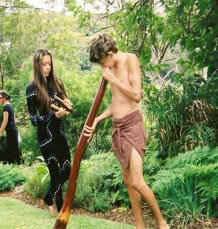 They encountered members of the Garigal clan, some in canoes, who appeared interested and approached the strangers. The water colour above depicts the two peoples apparently communicating. Little did the Garigal know that within a couple of decades some of the land would no longer be considered theirs. In 1816 400 acres (160 ha. 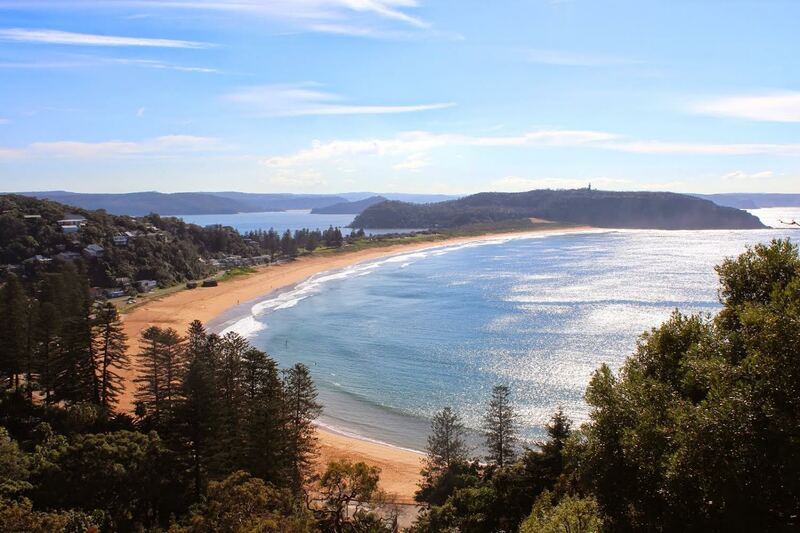 ), which included the Palm Beach peninsula and Whale Beach was granted by the Crown to the surgeon James Napper provided he cleared and cultivated 45 acres (10.5 ha.) within five years. The Napper grant remained virtually intact, except for the government resuming Barrenjoey and the sand dunes, until 1900 when several businessmen bought the remainder of the estate, subdivided the land and put it to auction. Only one block sold although another auction twelve years later, when roads to the area had improved, brought better results. Gerald Hercules Robinson was born in Dundee, Natal, South Africa in 1893 and spent much of his early life in orphanages with his sister Eileen as their mother had died shortly after he was born and their father left to fight in the Boer War. The children’s father eventually returned, remarried and took his family to England. Sadly Gerald did not get on with his stepmother and, in 1908 when he was only 15 years old, one of his aunts gave him 25 pounds to emigrate to Australia. A resourceful young man his first job was jackerooing on various properties around NSW, and then enlisted in the AIF as a private to fight in England and France. He had a distinguished war record and was awarded the Military Medal for Bravery at Ypres in 1917. Returning to Australia Mr Robinson started a business with some war buddies and married Violet Harrison in 1922. They had five children, four sons and a daughter. Gerald Robinson was always a devout Christian and very active in St David’s Church of England, Palm Beach and the Healing Ministry at St Andrews Cathedral, Sydney. World War II found him back in the army for several years but in 1943 he was able to resume his business activities in Sydney. Mr Robinson purchased the Bible Garden block in 1957, with no particular purpose in mind, but soon decided that ‘this glorious view of creation was too lovely for a house’. He then heard about a Bible garden in the grounds of Bangor Cathedral in North Wales established by Professor Tatum Whitehead. After visiting Bangor Cathedral in 1963 he was inspired to create one on his land at Palm Beach. 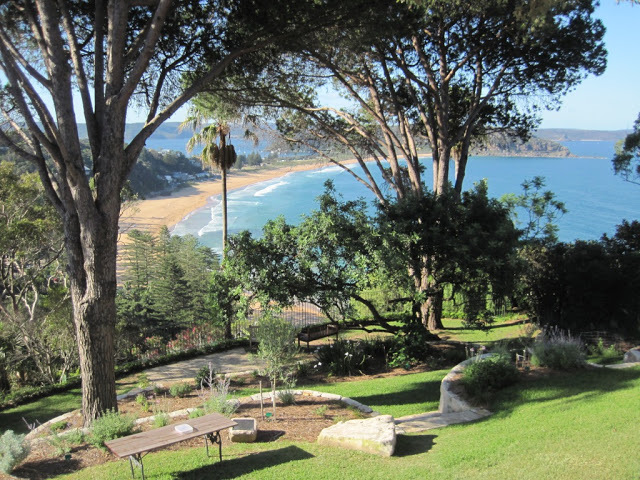 Already in his seventies, Mr Robinson commenced work establishing the garden devoted to plants in the Bible’s Old and New Testaments and did most of the initial work of terracing the steep land and creating garden beds himself. The Palm Beach Bible Garden was designed and planned in a similar fashion to the Welsh Bible garden, with plantings laid out in biblical chronological order, commencing with plants at the top of the slope mentioned in the book of Genesis and ending with a plant at the lowest point of the site representing immortality, Helichyrisum oriental. Many of the plants were germinated from seeds which had been imported from overseas by Mr Robinson because these sorts of plants were generally not well represented at local nurseries. G.H. Robinson envisaged the Bible Garden as encouraging ‘comprehensive reflection of biblical meanings and to serve as a collection of Holy land plants’. The founding trustees were GH Robinson and his daughter, Deaconess Beatrice Robinson. The Right Reverend F. O. Hulme-Moir and Gerald Lacey Robinson (a son of the founder) joined Beatrice as trustees in the1970s. 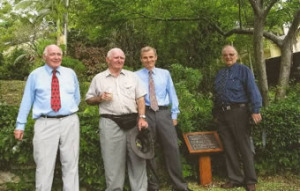 The Bible Garden was officially opened at a ceremony performed by the Hon Mr Justice Richardson on 26 March 1966. 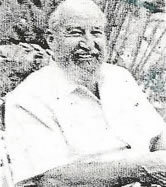 During the 1960s Gerald Robinson worked three days a week planting the garden, building stone retaining walls and steps and maintaining what he had already created. Apart from the biblical plants he installed ten lamps commemorating Bible. The first six refer mainly to the Old Testament and the last four the New. The surviving lamp, the ninth, is dedicated to St Peter and St James, two of Jesus’ disciples. Gerald Robinson died in 1972, aged 79, in his home next to his beloved Bible Garden, after creating and tending it tirelessly for many years. His generosity which allowed anyone to visit his fascinating and beautiful garden was an example of his devotion to Christianity and its principles. Of the 148 plants mentioned in the Old and New Testaments, it is believed 143 were planted by Gerald Robinson in the Bible Garden. Plants were given numbered markers and keyed to a 15-page brochure he compiled. Over the centuries there have been many different interpretations as to what the exact plants are which are mentioned in the Bible. Many people believed that the fruit which the serpent tempted Eve with was an apple but research has now shown it to be an apricot. What’s known as the Rose of Sharon is in fact Hibiscus Syriacus. This has led to some confusion and much debate between biblical scholars and others. Plants are mentioned not only for nourishment, usefulness and beauty but also as symbols of, such things as, faithfulness, punishment, events and immortality. 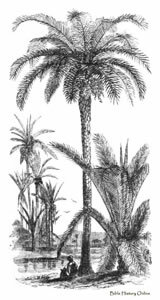 Sourcing many of the exact plants referred to in the Bible can be quite difficult and some of those would have been unsuited to the climate of this region. Various modern species of these same plants have been adapted for growing in a variety of climates and are considered appropriate substitutes. These have allowed a very good representation of biblical plants in the garden. Beatrice Robinson compiled a second brochure in 1977 describing the plants in each garden bed, the Biblical reference and their use and meaning in context. This little brochure is evidence of the remarkable number of Biblical plants which Mr Robinson had managed to collect and establish in ten years. 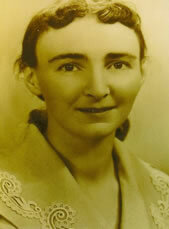 Beatrice Robinson, known as Bea, studied theology at Sydney University and was ordained a deaconess in 1965. She had strong views regarding the ordination of woman as priests and declared, in 1989, ‘it was a much needed reform, appropriate at this time’ and ‘If the church wanted to accept me as a priest I would accept immediately’. At the time of her father’s death Bea lived in the cottage, Tree Tops, built for her by her father underneath the elevated section of the concrete driveway to the north of the Bible Garden. She divided her time between the garden and her duties as a deaconess at St David’s. While Bea lived at Tree Tops she established a display room where visitors could study Bible plant illustrations, books and other material describing the Bible Garden as well as other Christian literature. Like her father she built up the plant collection by importing seeds and did most of the gardening herself. Beatrice died in 1994 and in her will left a generous donation to continue the upkeep of the garden. Following Beatrice’s death her four brothers became trustees. 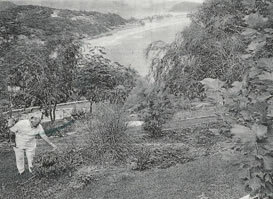 During the following years members of the Robinson family and friends maintained the garden supported by donations which paid for lawn mowing. Barbara Robinson, wife of Gerald Lacey Robinson, served as curator 1994-2004. In 1999, after much deliberation, the trustees agreed to sell the site unless a viable alternative was put forward by any of Gerald’s direct descendants. In 2000 the trustees received a land tax assessment but upon appeal it was withdrawn, however, they considered that the possibility of future land tax liability and the burden of maintaining the elevated driveway and cottage posed intolerable problems for the continuation of the dual Bible Garden and residential uses of 6 Mitchell Road. By this time many of the 143 Biblical plants originally planted had, despite constant attention, dwindled to about 15. 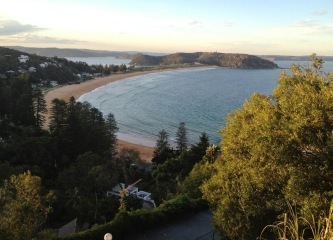 As could be expected the climate at Palm Beach is quite different to the Mediterranean so many had failed to thrive. The trust deed allowed for partial or total sale providing the garden is re-established elsewhere. 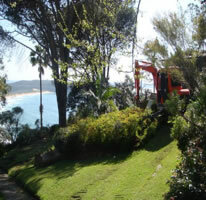 In March 2001 Pittwater Council was asked to consider permitting a subdivision with Council taking joint responsibility for maintenance of the Garden. The aim was to create two lots, one residential, the other the Bible Garden and to ensure its appropriate ongoing maintenance in perpetuity. 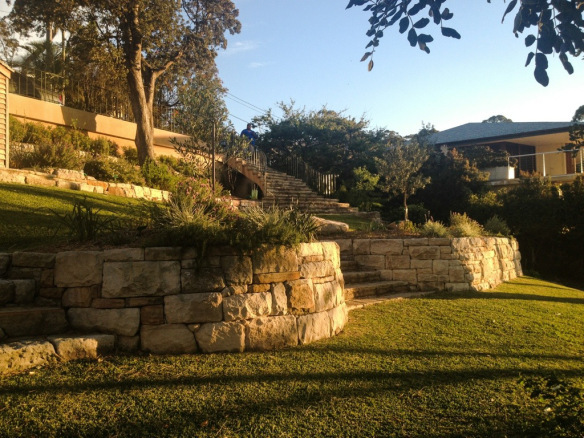 A heritage report completed by Chris Betteridge, heritage consultant, in 2001 assessed the Bible Garden as having state heritage significance and also concluded that the proposed subdivision would have little or no negative impact on the place’s heritage significance. 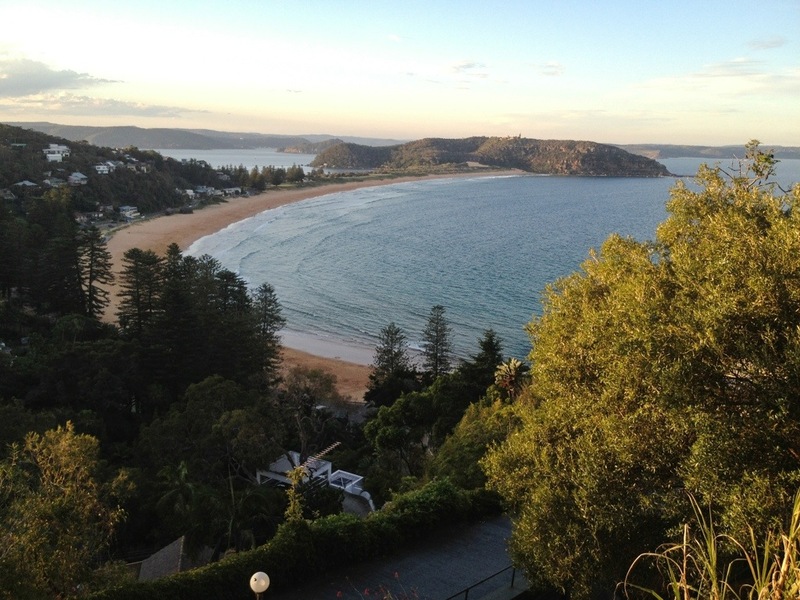 Finally in 2004 Council entered into a Heads of Agreement with the trustees and the subdivision application was lodged with Pittwater Council in November 2000 and approved in April 2005. Meanwhile supporters of the Bible Garden had obtained incorporation of ‘Friends of the Bible Garden Memorial’ under the Associations Incorporation Act 1984. Membership grew and by the end of 2004 there were 127 memberships of the Friends, representing about 169 people (due to family memberships). An active Friends group was critical to saving the Bible Garden as gardening and maintenance would be provided by the Friends, easing the financial burden of Council as landowner. Early in 2006 Council became landowner of the Bible Garden. On 18 March 2006 the handover to Council and the Friends was celebrated at a ceremony in the Garden attended by over one hundred Friends and citizens. Among those who attended were descendants of the Garigal. In October 2006 a plan of management was publicly exhibited for the Bible Garden. The plan describes the proposed landscaping improvements, the permissible uses for the Bible Garden, and arrangements regarding wedding bookings and how the Friends and Pittwater Council work together. A number of concepts were debated with the Friends and Council and in 2010 Paul Scrivener, landscape architect, was awarded the contract to design and oversee the restoration works. By that time few, if any, of the original small Biblical plants had survived although some major trees had. Planted by Gerald Robinson in the 1960s, and still standing proud in the garden, are two stone pines (pinus pinea), two carob trees, an oak (quercis ilex), a weeping willow (salix babylonia), a crab apple (malus sp.) and some vigorous grapevines. Along with the plants several original items survive such as the Ten Commandments plaque, the wooden cross and the last of the ten lamps. These were carefully protected during the building works which had to address a number of practical problems such as access, parking and safety as well as reconstruction of retaining walls and steps. The restoration respected Mr Robinson’s original layout of garden beds, steps and pond. Safety fencing was required at the top and bottom of the site and an access stairway. 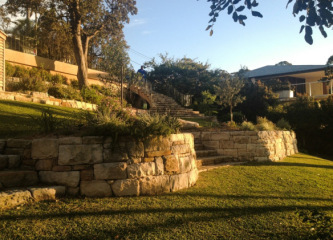 The stone retaining walls and steps were rebuilt in very much their original locations in the traditional Palm Beach style using rock faced sandstone. In 2012 building work was completed and the task of replanting commenced. The original philosophy of only Biblical plants is being strictly adhered to, the concept of a garden, as opposed to a park, is being persevered as is the 1960s spirit and character which Mr Robinson envisaged for his garden fifty years ago. Saturday 29th September 2012, the renovated Bible Garden was officially opened by Professor Marie Bashir, Governor of N.S.W. Present were a number of local dignitaries, plus members of the Friends of the Bible Inc. and other visitors. Whether it be a wedding, naming ceremony, bible groups, local artists, all are welcome to contemplate the sheer beauty of nature. Income from bookings and donations go towards the upkeep and plants of the Bible Garden.